Be the first to share your favorite memory, photo or story of Mahlon. This memorial page is dedicated for family, friends and future generations to celebrate the life of their loved one. 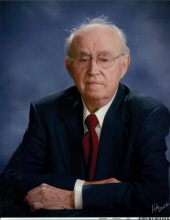 Mahlon J Buckwalter, 98, of Palmyra, passed away Saturday, March 16, 2019, at Beth Haven Nursing Home in Hannibal, MO. Funeral services will be at 10:30 AM Saturday March 23, 2019 at Lewis Brothers Funeral Chapel in Palmyra, MO. Burial will follow at Greenwood Cemetery with full Military Rites given by American Legion Boots Dickson Post #174. Reverend Eric Anderson will officiate. Visitation will be held Friday March 22, 2019 from 5:00 PM to 7:00 PM at Lewis Brothers Funeral Chapel in Palmyra, MO. Mahlon was born May 17,1920, in Palmyra, MO to Harry Rohrer and Harriet Lenore Harsh Buckwalter. He married Ada Lucille Bonebrake on April 29, 1945 in Hannibal, MO. She preceded him in death on May 12, 2005. Survivors include his children, Janis L. Lomax, Palmyra; James A. Buckwalter and wife Donna of Hannibal; David L. Buckwalter and wife Terrie of Palmyra; Judith A. Cotterill and husband Brian of Dubai, UAE; and Richard W Buckwalter of Palmyra; 14 grandchildren and 27 great-grandchildren. Mahlon loved his children through deeds and sage advice. He was preceded in death by his parents, and seven brothers, John, Amos, Paul, Nathan, Allan, Wayne, Arthur and one sister, Mary Nelson; one brother, Warren Buckwalter, of Hannibal survives. He was a 1938 graduate of Palmyra High School and a member of the United Methodist Church of Palmyra. Professionally Mahlon was a machinist for Gardner-Denver in Quincy, IL, for 36 years, and a 50-year plus member of the international Association of Machinists and Aerospace Workers. He was a four year member of the United States Army enlisting September 16,1941 until his honorable discharge on September 2, 1945. He served during World War II and was stationed in England in Air Offensive Europe and Rhineland Campaigns flying 31 combat missions. 20-plus years as well as completing many "fix-it" jobs there. He was an avid outdoorsman who enjoyed gardening, bird watching, hunting and particularly fishing. He spent many hours at North River Dam, Re- Regulation Dam, and ponds often catching the "big "one. Trips to Canada for fishing were also a pleasure. Pallbearers: Lyndell Lomax, Alan Buckwalter, Lucas Buckwalter, Lance Lomax, Andrew Buckwalter, and Jacob Buckwalter. Honorary Pallbearers: Nathan Buckwalter and Tyler Buckwalter. Memorial contributions may be made to Palmyra Nutrition Center or Marion County Library Sub- District 1. To send flowers or a remembrance gift to the family of Mahlon J. Buckwalter, please visit our Tribute Store. Memorial Contributions may be donated to The Palmyra Nutrition Center or Marion County Library Sub- District 1. "Email Address" would like to share the life celebration of Mahlon J. Buckwalter. Click on the "link" to go to share a favorite memory or leave a condolence message for the family.